Cookie dough has been an obsession of mine since childhood- I would eat a whole tub of it if there wasn’t the chance that I’d get salmonella and a horrible stomach ache lol 🙂 So you can probably imagine my reaction when I found this recipe!! 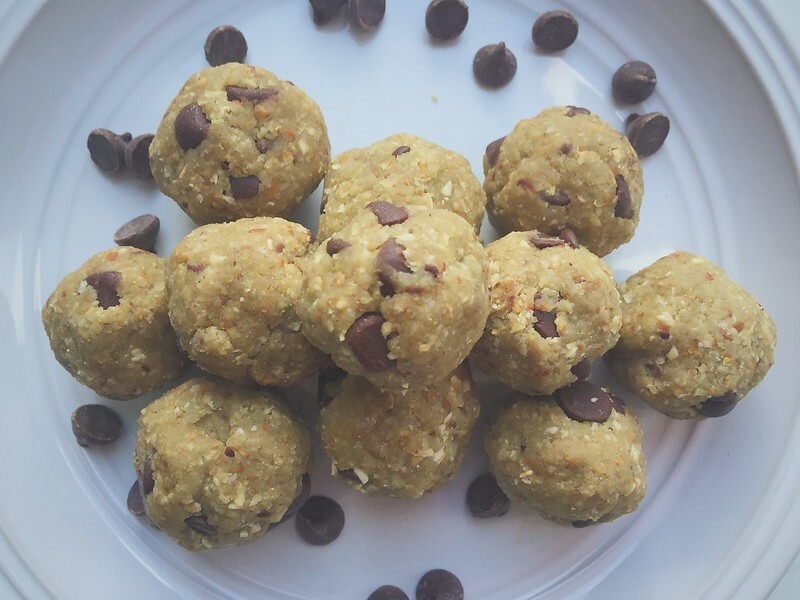 These are basically little balls of protein-packed edible cookie dough and they taste incredible!! Plus they’re not too sweet so they don’t weigh you down, probably because they’re made with all-natural ingredients! Great for pre/post-workout snacks due to their energy-boosting properties, or just as a healthy anytime snack. Directions: Grind cashews (or almonds) and oats in a food processor until turns into a powdery, flour like texture. Add syrup (or agave), vanilla, and protein powder and process until smooth. (almonds won’t blend as smooth as the cashews but it’s okay!) Stir in chocolate chips. Roll into one-inch balls and store in refrigerator!